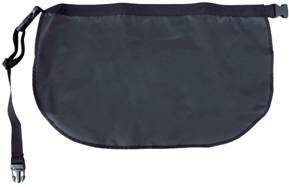 You can choose from our complete line of Blackjack Cut Cards, Toke Boxes, Dealer Aprons, and other Blackjack Accessories. All our Blackjack Supplies are in stock for immediate shipment. We also offer Blackjack Layouts, Blackjack Dealing Shoes and Discard Holders, Blackjack Tables, Bee Playing Cards for Blackjack, and more! 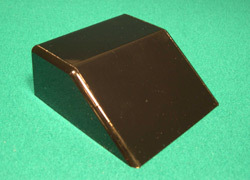 Your satisfaction is fully guaranteed when your order Blackjack Accessories and Supplies from us. The No Peek 21 device is a patented hole card reading device designed to work with "No Peek" style playing cards. 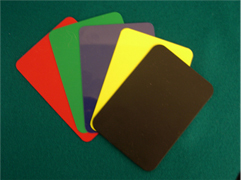 Our durable plastic cut cards are available in red, green, blue, yellow, and black. 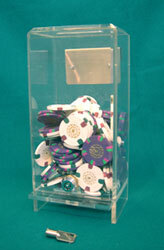 Our money drop boxes are available in standard size (8 x 8 x 12 inches) and slimline size (5-1/2 x 8 x 12 inches). 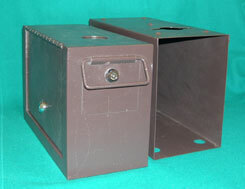 These drop boxes feature durable sheet metal construction and a slotted top to accept money paddles. Locks and keys are available. This durable black shoe roller fits all of our casino quality / professional dealing shoes. Four toke boxes are available: 1) clear lucite toke boxes with a bracket, which measure 5-1/2 x 3-1/4 x 10 inches 2) lucite toke boxes with lock and key 3) metal toke boxes with brackets and one or two windows, which measure 5-1/2 x 3-1/2 x 8-1/4 inches and 4) metal toke boxes with locks and keys and no windows.